In this talk, Khenpo Sodargye speaks about what makes a good teacher and how teaching can bring about happiness. During this, he also stresses the importance of the role of teachers: being the engineers of the human soul, they carry the responsibility of shaping the mind and morality of children as well as the future of a nation and that of the entire humanity. 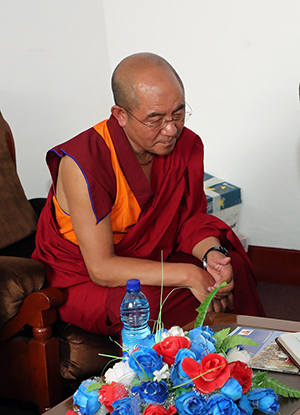 As a teacher himself, Khenpo shares his secret of being an attractive teacher as well as his aspiration for this career. 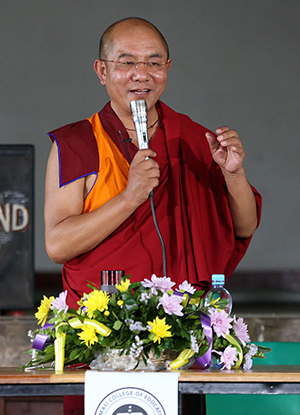 Along the theme of happiness, Khenpo also points out that happiness from external materials is only a perception of the mind and true happiness must come from within. A teacher should use his lamp of wisdom to illuminate the darkness of ignorance in children’s minds. A teacher is like a candle whose light can be passed down (by igniting others) for thousands of generations; in terms of scope, a good teacher can have students all over the world. Therefore, some people may believe money is the source of happiness, some believe beauty brings about happiness, and some deem love as the source of happiness; while to me life with learning and teaching is the happiest of all. Many people are engrossed in the pursuit of joy and happiness. However, in fact, happiness is no more than a perception of our mind. For example, a man with 100,000 yuan may believe that 200,000 yuan would make him happier, or a fancier car would do more than an ordinary one. A single person may believe that sweet love would make him the happiest person. Therefore, if we discern deeply, we can find that our current sense of happiness will always be replaced by the feeling of wanting more, because of the mentality of discontentment. I find that here in many places of Africa, I can often see many people dancing, and hear the laughter coming from your hearts. It seems that you are always in a state of joy. However, such inner happiness may vanish when things become more materially abundant. My aspiration is to be like my own teacher, His Holiness Jigme Phuntsok Rinpoche. His Holiness is a great teacher who started to teach at around 15 years old until he was 72, the year when he entered into nirvana. It’s been about 15 years since he left us. Over the last 10 years or so of his life, even though he could barely see, His Holiness kept teaching by first listening to the text that he was going to lecture on through a recording tape made by his disciples beforehand. Throughout his life, he taught for more than 50 years incessantly. It’s hard to say whether I can be that persistent like him, but I do aspire to keep teaching for more than 40 years of my life. What a teacher should expect is nothing other than making sure the students learn to the best of their ability. Every student has great potential that many teachers fail to fully exploit; and there are some who may not be A students back in school yet became very successful later like Steve Jobs and former US president Roosevelt who initially had not so good performance at school but their potential developed gradually afterwards. As a teacher, I am always full of hope and confidence in every one of my students. I also have great passion for teaching, and because of that, my words often carry power and interest—that enables the students to relate to what I am teaching. The most important education in Buddhism can be summarized with one sentence in the sutra, which is: “To refrain from doing any evil, to cultivate all good, and to purify one’s mind—this is the teaching of the buddhas.” That is to say, conduct that is harmful shall be avoided such as killing, stealing, sexual misconduct, and lying; Conduct that is beneficial shall be adopted such as following the Ten Positive Actions, helping others, and making a contribution to humanity as well as to all sentient beings; To purify one’s mind means to keep a peaceful mind and stay happy, rather than be always disturbed by negative emotions like anger, desire, ignorance, etc. These are the three main characteristics of Buddhism.